Were you able to get your desktop fixed? Also interested to know if you plan on having a prospect profile for each player like the one you have for Michael Porter Jr. on your wordpress page. TGsoGood wrote: Were you able to get your desktop fixed? Unlikely. No traffic there and not much interest in modding in general these days. We'll see as the project progresses. Any other updates on the draft class? Humble wrote: Any other updates on the draft class? Currently working through portraits. We have the 27 cyberfaces on the first page, but without better reference photos making faces is an uphill battle. will it be compatible with the dna roster ? It will not be compatible at all with the DNA roster. It will be compatible with my 2017-18 Real Roster. That roster is ad-free, with updated portraits, exclusive tattoos, and high quality cyberfaces. There’s a thread on this forum for that. It’s also updated quickly and will have all of today’s roster changes in about an hour. its like playing fifa 18 or pes 18 guys come on! and what about the missing faces like the default rookies ? Quite frankly I feel the faces in the DNA roster are of low quality. If you look at the page for that roster and compare the two faces for Justin Patton, I personally feel like the DNA face is less representative of 2k18 quality. The 2017-18 Real Roster includes missing players. If you prefer the DNA content, you can always edit the files so they don’t conflict. Absolutely. 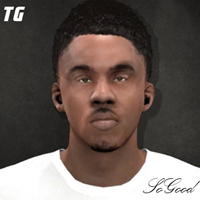 100% compatible with the 2k roster. I've been very clear that this will take time. I also said that it depended on the speed with which faces were made. There are very little resources for college prospects and the cyberface creators have become busy with other things. It's not even the NCAA tournament and the draft is months away. This is a project being developed slowly. That's just the reality of it. How many faces are you looking to have in total? TGsoGood wrote: How many faces are you looking to have in total? I think we currently have 27. Would ideally like 60 for two full rounds, but 30+ is probably more realistic. That's at least a full first round. Problem is there are very little resources. De'Anthony Melton withdrew from school to focus on going pro. Now we know he will enter the draft with 100% certainty. Just putting this info out there in case someone wants to make his cyberface and portrait. TGsoGood wrote: De'Anthony Melton withdrew from school to focus on going pro. Can you give a date when the draft class will be finished? Its amazing nice job keep it up !! berbi11 wrote: Can you give a date when the draft class will be finished? Its amazing nice job keep it up !! Why not release the first round ? Or at least the finished CFs ? KJBucket wrote: Why not release the first round ? Or at least the finished CFs ? Then it’s an incomplete project. If people just want the cyberfaces then they can look elsewhere for the time being. This is planned as a project, not for individuals to cop their favorite college player.